I'm always making birthday cards. One can never have enough. I love this colour combo. My favourite colours. I used the Coluzzle to make the oval for the "Happy Birthday" sentiment. all the flowers are mounted with dimensional. p.s. My dad is at home now. The doctor never told use what is wrong with him but I'm glad he is o.k. Thank you for all your prayers. Another Father's Day card or it can be a birthday card. My dad's birthday is coming up on June 2. He is in the hospital right now. The doctor did not say what kind of sickness he is having but have to stay for few more days. I hope he is able to be out before his birthday. Please pray for his salvation and for fast recovery. 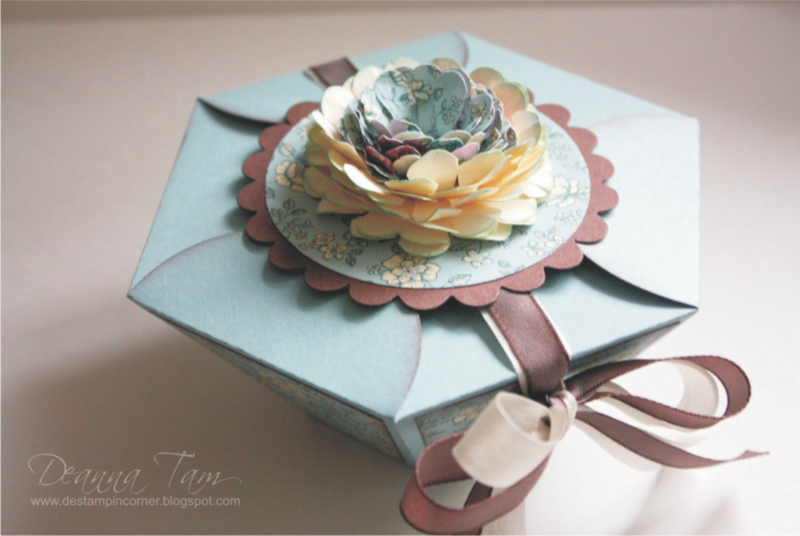 Here is a card that can hold a gift card or money. It is a perfect gift for Father's Day. It uses a 4 1/4" x 10 3/4" card stock score at 4 1/4" and 8 3/4". I got this idea from Dawn's Stamping Thoughts. She is such a talented lady. I didn't have any other gift cards one hand so I use the Linens and Things gift card for you to see how the gift card fit inside the card. I use the word window punch to punch out the slot to hold the gift card. Father's Day is coming soon and I'm making some cards for the upcoming Father's Day class. Here are two cards I came up with so far. Hope you like them. Both cards are made from the For Father stamp set from the Occasion Mini (which the date is extended until the end of June). Yay! This mini catalogue is so awesome. I love all the sets that are in there and the new designer papers, they are just gorgeous. If you live in Canada and don't have a mini catalogue yet and would like one, email me and I'll send one to you. Or you can view it here. Well, thanks for stopping by! Have a great day! Here are two cards I made with my new 'A Light Unto My Path' stamp set. I love the sentiment that is from the Bible. Here are three graduation cards I showed my friend. She picked the last two. Goods choices. I like them all. My DH think the first two looked like Christmas cards. Come to think of it I think he is right. Have a wonderful Wednesday! Thank you for looking! This was one of the congrats card I made for a friend but never showed it to her. She doesn't need it anymore for this year. Now she want anniversary cards. Well, I better go and make some. Thanks for stopping by! Have great day! I made this wall hanging sample for the Mother's Day class in May. We did the three panel one (see here) and I wanted to show them they can do one also. This wall hanging was so simple and fast to make. I used the Afternoon Tea DP for the background and the One of a Kind stamp set flowers and punched them out with the Boho Blossoms punch. I put rhinestones in the middle of the flowers and then mounted the flowers with dimensional. updated: That is Hope, my youngest, in the picture. Well, since there was only three people commented on the blog candy, I thought I'll give all three the blog candy. So email me with your addresses and I'll mail the candy out to you. If you prefer a different sentiment on the card I'll gladly change it for you. Just let me know in your email. It is long weekend here in BC and I'll be enjoying the beautiful sunshine we're having. Today's Splitcoaststampers Grid Technique. This is what I came up with. This card is perfect for a friend. She loves dogs and I want to thank her for hosting a Mother's Day class at her house. I had a blast teaching her friends. A card for a friend to congratulate her. Hope she likes it. I love this One of a Kind stamp set and uses it a lot. Wishing every moms out there a wonderful Happy Mother's Day. I made this for a class on Friday so I'm giving these two cards and treat pouches to two people. Leave a comment here how your Mother's Day was or if you are not a mom, how did you celebrate this special occasion with your mother. I'll Pick two winners on Friday May 16. Good luck! My Mother's Day was great. My husband made me an omelet for breakfast and the kids surprised me with a hand stamped card and perfume. Then DH took me out to "The Pen" for lunch. After we went to my nephew's birthday party. It was a busy Saturday full of activities. Here's the card my children made for me. They knew I love the flower from the Embrace Life stamp set. My five year old did the sentiment. Thank you Jarod, Faith and Hope. You're all so special to me. God has given me three wonderful children. I love you. Hello, everyone! Beautiful day today. I love the sunshine. I have a busy day today so I'll be quick. I made this for a friend for her wedding. She got married yesterday. I can't wait to see her wedding photos. The sentiment and the floral background was embossed and the brown flower or whatever you call it had crystal effect on it. The card looks better in real life. Thanks for stopping by. Have a wonderful Mother's Day weekend. This year's Mother's Day is also my wedding anniversary day. Wow! Can't believe is 12 years already. Beautiful butterfly and some flowers. This is from the third level hostess set "Time Well Spent". I made a lot of cards with this set but finally I used the butterfly stamp. I put dazzling diamond on the butterfly and the flowers. It made the card very pretty. For whoever is interested on how to make the lid for this box I did a tutorial for it. Score 1 3/16" all four sides. Cut four sides on the long side. Trim off two flaps as shown in the picture. I drew in the scoring lines on my card stock so you can see where the score lines are and the cutting. Put snail adhesive on the two flaps . Adhere the flaps to the sides. This is how the lid looks like before adhere to the box. Put snail adhesive to the flap that is hanging out and adhere to the box. Hope the instructions are clear enough. Maybe not the explaining but hopefully the photos will. Thanks for stopping by! Let me know what you think of my first tutorial. Did this class on last night with a bunch of ladies. They all had fun making it. Thanks ladies for a great time. I really enjoyed it. We used mat boards for the frame and Crop-A-Dile (got to love this tool) to put those jumbo eyelets on. This is a One of a Kind stamp set I used for this card. I like this set a lot and use it all the time. I also love the punch that goes with it. Whether you’re looking to join for the great discounts, an exclusive demonstrator benefits…or you’d like to make some extra money-May is a fantastic month to join! Stampin’ Up! just announced a 20% discount on the Demonstrator Starter Kit. 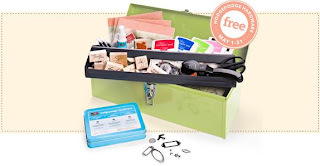 (page209) PLUS a free tin of Hodgepodge Hardware (a $35.95 value). Email me today at mrstam007@gmail.com if you would like more info on starting your own stamping business. 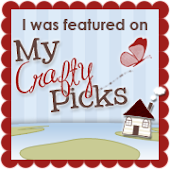 Spend $40 on Stampin' Up! products and get 25 percent off any On Board items from the Spring-Summer Collection until May31,2008. 110712 On Board Book Basics Small $5.63 $5.